Wild & Küpfer AG develops, produces, assembles and supplies plastic parts to complete high-end system solutions for industry and medicine. Since 2015, the family-run company relies on our Warehouse Management System (WMS) Logis. In the future, the high-tech company wants to bring pallets automatically from production to freight forwarding by means of automatic material handling equipment, also known as AGV (automated transport vehicle). To enable this, the logistics and supply chain management of Dataphone must create an interface between the LVS Logis and the AGV. The AGVs are delivered by Agilox, based in Austria. The products are directly picked-up from the injection molding machines and then brought to a defined destination (freight forwarding) by the AGV. After removal, the injection molding machine is again equipped with a specific empty pallet, which the AGV gets from a pallet dispenser. The AGV «knows» through Logis, which injection molding job is running on which machine and which pallet must be loaded with which goods. Wild & Küpfer counts around 30 injection molding machines and 5 pallet staplers. BELIMO Automation AG is also strengthening its factories in Hinwil (CH) and Danbury (USA) with a driverless transport system. The automatic transport system replaces transports, which were previously completed by forklift drivers. The AGV circulates in Hinwil on the busy routes between customizing and freight forwarding and between incoming goods, high-bay warehouse and customizing, for storage, replenishment and sales orders in Danbury. The AGV does not drive on its own routes, but shares the corridors with employees and pallet transporters. Reflectors on the walls (2.5m above ground) enable the AGV to navigate through the warehouse. Transported goods of the logistics and supply chain management include euro pallets, full and half pallets as well as wooden boxes. Via our WMS system Logis, specific areas are defined which serve the AGV as starting point. If a pallet is unloaded in this area, the AGV receives a transfer order (inlcuding information on pallet location and destination) and independently decides where to transport it. In addition, the vehicle automatically detects when target areas are already taken, for example, by other pallets. In this case, the AGV chooses an alternative destination of the pallet. The Swedish company AGVR is the supplier of BELIMO's vehicles. Dataphone ensures the smooth integration of the devices of two different suppliers into the LVS Logis for both Wild & Küpfer and Belimo. Both AGVs have sensors that immediately stop the AGV as soon as people, pallet transporters or goods are in the driveway. Go-Live in Hinwil is in October 2017. From January 2018, the introduction of a comparable AGV is planned for the BELIMO Danbury site - adapted to the local warehouse structures. The go-live at Wild & Küpfer takes place in November 2017. And what does the future bring? The use of several AGVs is possible as well as the delegation of entire processes to the devices, such as e.g. the waste disposal. Relocation in Shanghai. BELIMO Automation AG has been using our LVS Logis for many in its Swiss headquarters in Hinwil as well as abroad. The latest Logis installation was completed in Shanghai. Dataphone transferred the existing Logis installation to the Chinese metropolis. An adaptation of warehouse, production and customizing processes was carried out for the WMS system. Furthermore, Logis can entirely be translated into Mandarin in future. In summer 2017, a change of location was announced: BELIMO Shanghai moved into a new and modern building. Dataphone was involved in the relocation and reviewed all Logis processes and adapted them to the new warehouse structures. Template tool. All BELIMO locations around the globe are now being controlled through Logis on the same code basis. Patches can easily be staggered and imported directly over different time zones. 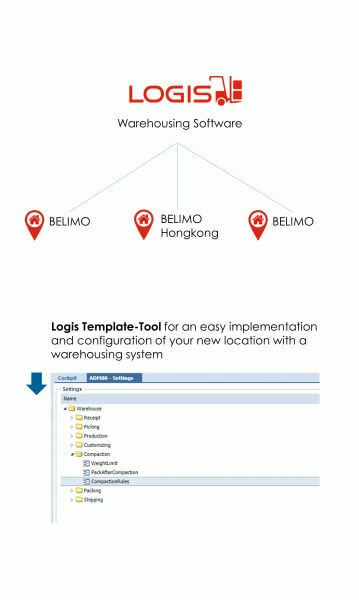 BELIMO Hong Kong is now able to re-equip smaller sites in self-government with Logis by our simple template tool. The template tool, in addition to numerous configuration options, also provides a clear guide for the independent implementation of the logistics and supply chain management system Logis. Fully automated logistics systems. Belimo Automation AG offers a wide range of products in actuator and valve technology for heating, ventilation and air conditioning systems. The internationally operating company has been using our Logis warehouse management software at its headquarter in Switzerland as well as locations in the USA and China since 2006. Whether logistics, internal transport, order picking, packaging or outgoing goods: Belimo tracks, controls and optimizes all its warehouse processes through Logis. Complex interplay. Logis takes into account the complex interplay within ERPs, warehouse management software (WMS) and material flow controller (MFC) systems. The solution also enables Belimo to integrate and control a wide range of automatic storage and rack operating systems. The automated goods movements go hand in hand with the manually executed goods shifts and process steps. Belimo increases its operational efficiency and storage capacities through the integration of fully automated systems. Efficient and fast. At the headquarter in Hinwil, up to 40 combinations of storage and retrieval systems in high rise storage racks (HRS) and 130 container movements in small parts storage (SPS) are carried out per lane in one hour today for the logistics and supply chain management system.